Former Australian Open champion Stan Wawrinka was handed a lucky break after going a set down to Latvian Ernests Gulbis in the first round before his opponent retired in the second. The Swiss made his comeback at last year’s Australian Open after a series of knee operations but fell away to youngster Tennys Sandgren before improving his form for the year to end on 17-17 and ranked 66th. 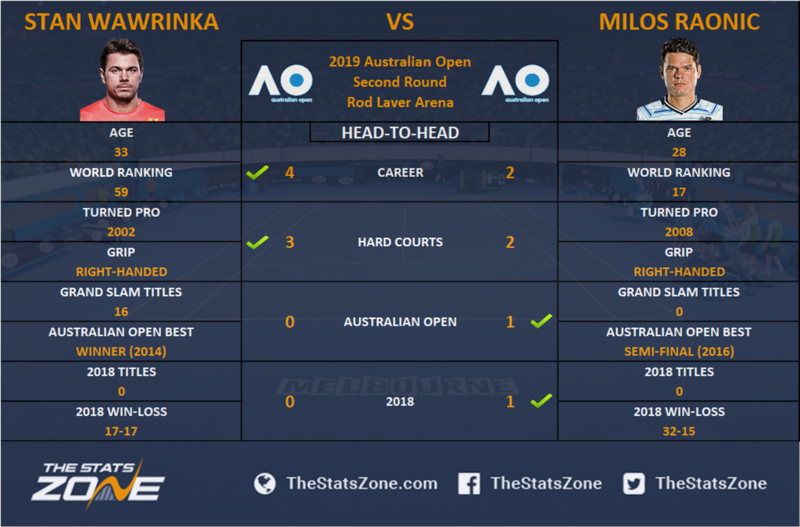 Wawrinka, now world number 59, has a 4-2 head-to-head record against Milos Raonic but notably the Canadian has won the previous two, with both of those on hard courts. World number 17 Milos Raonic is on his way back up to the top 10 after a bad dip in form early in 2018 and showed great intent in his dominant display over gifted Aussie Nick Kyrgios in the first-round. Raonic’s 2018 record of 32-15 is promising for his return to the best of his abilities, but he had lost six of his last eight prior to his Australian Open campaign. Raonic’s 2-4 head-to-head with his second round opponent Stan Wawrinka is deceptive, with both the Canadian’s victories coming at Grand Slams; the Australian Open in 2016 and last year’s US Open in straight sets. It will be a shame to have met so early in the draw for the loser of this second round tie, having both gone through a difficult spell within the last year and now coming back into form. It is easy to forget Wawrinka’s pedigree; he is a three-time Grand Slam champion after all, but his recent surgeries have started to spell the end of his career at the top of the game. Raonic fits the bill of several talented players within the last decade who are unlucky to have been playing in the time of tennis heavyweights, but he can go further in this competition than Wawrinka if he keeps his nerve. RAONIC IN FOUR SETS.